House Republicans are taking action this month to provide relief and deliver patient-centered health care. Premiums have increased by an average of 25 percent this year. Nearly 1/3 of all U.S. counties have only one insurer offering plans on their state’s exchange. 34 percent fewer doctors and other health care providers accept Obamacare insurance compared to private insurance. President Trump called on Congress to “act decisively” to rescue Americans from this failing law, and House Republicans are answering his call. More than eight months ago, we outlined our vision for repealing and replacing Obamacare in A Better Way. Since then, we have been talking with our constituents and colleagues about how to turn these solutions into policies that will improve lives. Now, House Republicans are moving forward with fiscally responsible legislation to deliver relief from Obamacare’s taxes and mandates and lay the groundwork for a 21st century health care system. Specifically, the primary Committees with jurisdiction over health care—Ways and Means and Energy and Commerce—have released legislation that not only repeals the law, but replaces it with reforms President Trump laid out. Dismantles the Obamacare taxes that have hurt job creators, increased premium costs, and limited options for patients and health care providers—including taxes on prescription drugs, over-the-counter medications, health-insurance premiums, and medical devices. Eliminate the individual and employer mandate penalties, which forced millions of workers, families, and job creators into expensive, inadequate Obamacare plans that they don’t want and cannot afford. Prohibit health insurers from denying coverage or charging more money to patients based on pre-existing conditions. Empower individuals and families to spend their health care dollars the way they want and need by enhancing and expanding Health Savings Accounts (HSAs)—nearly doubling the amount of money people can contribute and broadening how people can use it. Help Americans access affordable, quality health care by providing a monthly tax credit—between $2,000 and $14,000 a year—for low- and middle-income individuals and families who don’t receive insurance through work or a government program. Frequently Asked Questions (FAQs)What does your legislation do? Our plan delivers relief from the taxes and mandates that have hurt job creators, increased premiums, and limited options for patients and health care providers. It returns control of health care from Washington back to the states and restores the free market so Americans can access the quality, affordable health care options that are tailored to their needs. How will your legislation be better than Obamacare? Obamacare was based on a one-size-fits-all approach that put bureaucrats in Washington in charge of your health care. The law led to higher costs, fewer choices, and less access to the care people need. What we’re proposing will deliver the control and choice individuals and families need to access health care that’s right for them. And we provide the freedom and flexibility states, job creators, and health care providers need to deliver quality, affordable health care options. How will this improve my health care? What we’re proposing will decrease premiums and expand and enhance health care options so Americans can find a plan that’s right for them. We also make sure Americans can save and spend their health care dollars the way they want and need—not the way Washington prescribes. No. Americans should never be denied coverage or charged more because of a pre-existing condition. We preserve vital patient protections, such as (1) prohibiting health insurers from denying coverage to patients based on pre-existing conditions, and (2) lifting lifetime caps on medical care. And we allow dependents to continue staying on their parents’ plan until they are 26. Are you repealing all of Obamacare’s taxes? Our plan delivers relief from all of Obamacare’s taxes, including dismantling taxes on prescription drugs, over-the-counter medications, health-insurance premiums, and medical devices. And we immediately eliminate the individual and employer mandate penalties, which forced millions of people into Obamacare plans they don’t want and cannot afford. Are you repealing the subsidies? Obamacare’s subsidies must be repealed. They are deeply flawed and leave millions of middle-class individuals and families without any help to pay for health care. Just as President Trump called for, we will replace Obamacare’s subsidies with a tax credit that helps Americans—including those Obamacare left behind—access health care options that are tailored to their needs. Are you repealing Obamacare’s Medicaid expansion? Medicaid is a critical program, but it has its flaws—including fewer choices and less access to quality care. Obamacare’s expansion made those flaws worse. Our proposal strengthens Medicaid and targets the program’s limited resources to the patients most in need. We will provide a stable transition and help ensure low-income Americans have access quality, affordable options through a new, competitive, state-based private insurance marketplace. No. We are working to give all Americans peace of mind about their health care. We will have a stable transition toward a system that empowers patients with more choices and lower costs. During the transition, Americans will continue to have access to their existing health care options. We even take steps to immediately provide more flexibility and choice for the people who purchase insurance through the individual marketplace. For example, individuals and families will be able to use their existing subsidy to purchase insurance—including the catastrophic coverage that’s currently prohibited—off of the exchanges. What happens to the coverage I get through work? We preserve employer-sponsored coverage—a vital benefit that helps more than 150 million workers and families access affordable, quality health care. How are you going to cover the millions of Americans who gained coverage through Obamacare’s Medicaid expansion? Our proposal provides Americans who do not receive insurance through work or a government program with an advanceable, refundable tax credit so they can access a plan that’s right for them—not one that’s dictated by Washington. How is this tax credit different than Obamacare’s subsidies? Obamacare’s subsidies were based on income, created a disincentive to work, and left millions of hard-working, middle-class Americans behind. Obamacare’s subsidies also only applied to insurance dictated by Washington, substantially limiting flexibility and choice. 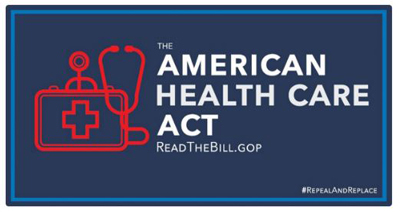 Our legislation repeals Obamacare’s flawed subsidies in 2020 and instead provides a tax credit to low- and middle-income Americans who do not receive insurance through work or a government program. Unlike Obamacare’s subsidies, these tax credits are based on age and family size and will gradually phase out as your income increases—making sure work always pays and hard-working Americans are never left behind. How big will my tax credit be? Will I be able to buy a real health care plan with it? Our tax credits are based on age and family size. Each year, low- and middle-income Americans will be eligible to receive between $2,000 and $14,000 to purchase health insurance, depending on how old you are and how big your family is. These tax credits will be credible—something that will make a meaningful difference for individuals and families when it comes accessing health care through a new, competitive, state-based insurance market. With all the other policies, we are proposing to increase choices and lowers costs, this tax credit will help people access the health care options they want and need. How will women be affected under your proposal? Our proposal specifically prohibits any gender discrimination. Women will have equal access to the same affordable, quality health care options as men do under our proposal. Will women be able to purchase a plan that covers abortions? No. Our proposal is consistent with the bipartisan Hyde Amendment, which does not allow taxpayer dollars to go toward funding an elective abortion. Won’t premiums increase when you repeal the individual and employer mandates because fewer people will participate in the individual market? By repealing taxes, rolling back regulations and mandates, and restoring control back to the states, our plan unleashes innovation and competition in the health care. This approach will result in lower costs and more choices. In fact, our plan is expected to lower premiums. And it will deliver much more flexibility for people to save and spend their health care dollars the way they want and need. How was this bill drafted? We’ve been talking about our ideas to repeal and replace this failing health care law for years. Many of the policies have even been passed by the House already. We outlined our vision for replacing Obamacare over 8 months ago, and have been working since then to turn these policies into legislation. The legislation is now online for our constituents and colleagues to review. The Committees will mark up their respective parts of the legislation this week and send it to the Budget Committee, where they will compile the final reconciliation package for the full House to consider. The Committees move their pieces of the legislation through regular order. There will be Committee markups on Wednesday so our Members can consider the policies, offer amendments, and vote on a final product. Then we send our final products over to the Budget Committee to put together and send to the floor for a House vote.